Amazingly, this is the one Record Store Day release I was actually able to buy at my local record store. At least there was one I didn't have to mailorder. When I was a kid they used to rerun the old Monkees TV show on Nickelodeon. I loved watching that show and I really dug the music as well. I had More of The Monkees and Then & Now: The Best of the Monkees on LP and I had their dreadful-in-retrospect 1987 comeback album Pool It on cassette. I've always kept some version of a greatest hits album of theirs handy. When it was announced that all of their 60's and 70's albums were being released on vinyl for Record Store Day, this was definitely one I wanted to pick up. Given the amount of albums in this set (10 LPs), the price was surprisingly reasonable as far as these things go. 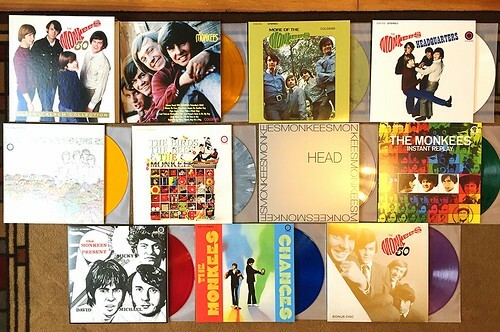 It's kind of impossible to write a succienct review of 10 Monkees records in the confines of this one review, so I'll try to summarize as best as I can. The Monkees hits are still hits no matter how you slice it. Also, the first few albums are pretty strong top to bottom. From Meet The Monkees through Pieces, Aquarius, Capricorn & Jones LTD these are just flat out good records. The Birds, The Bees & The Monkees and Head both have their moments, but for me, this is where the cracks start showing as many of the deep album cuts aren't quite as strong as their prior work. By the time we get to their 1969 album Instant Replay, we're starting to get into a real freefall as far as song quality goes. Sure, the Michael Nesmith, country tinged ones stay consistently strong for the most part, but, in particular, the Davey Jones songs really start to tank. They quickly become gaudy show tunes in the worst possible way. The Monkees Present is saved from total irrelevance by the outstanding Michael Nesmith song "Listen To The Band," and by the time the album Changes hits, there's just nothing left in the Monkees soul. Lastly, this set comes with a tenth bonus LP containing some singles and B sides that aren't on any of the other albums. It's a strong little collection and ends up being a better album than many of the later era Monkees records that were released as full lengths. The Record Store Day pressing of this box set is pretty great. Each album is on a different color vinyl and the sound quality is nice and perfectly serviceable. I probably would have preferred the mono versions of the early albums, but for a band like The Monkees, that's a minor gripe. It is nice to have all of these classing albums in one place in my collection. There are a ton of Monkees songs that I love, but I guess I wasn't as familiar with their entire catalog as I would have thought. There's some pretty awful stuff mixed in here, but those hits will always be hits for me. That actually wraps up my Record Store Day purchases for the year. It was a pretty quiet year as far as releases that I was actually interested. If not for the Swami releases, it would have been a real down year. I hope that the Record Store Day folks get their head back in the game next year. It's gone from a cool little event I looked forward to every year to a day filled with many releases that seem to only exist for me to mock. I could have grabbed one of these, but opted instead for a used copy of the CD box (10% of the cost)-I still find CD's way more convenient. I think I'd commented about my quest for the limited edition Todd Rundgren/Utopia vinyl piece this year. I'd sent a note to the RSD site and the record label. The label never responded but the RSD team did (Michael Kurtz). Michael was quite courteous, reminded me how much work the whole event was, how little control anyone but the labels had over the exclusives, and agreed that the people selling on eBay took away from the event. I thought that was that, until a couple weeks later, when Michael emailed me to tell me he'd seen the LP in a NYC store, picked up an extra copy that was mine if I wanted it for cost plus postage. I also find that a lot of the releases hold little interest for me, and some of the releases that do not get snapped up mystify me-the fact that a Monkees' collection was available at the third store I went to (about noon by then) had my head shaking.